Corn is steadily stacking up at this grain storage facility in south Arkansas. It was August 6, 2011, hot, dry, and perfect for harvesting corn, discounting the comfort level concurrent with 100-degree plus temperatures and high humidity. Archive post featured this week. There is not a new post this week, but we have updated a very popular previous post, “Only in the Ozarks, these falls, this store” with pictures we shot on the same trip in July of 2009, but have not published. These images are seeing the light of day for the first time. In that post, we take a look at some cool water falls, an old store, and other scenes you find in the Ozarks. This now updated post is one of the most visited on the site. I’m guessing at one time folks roasted corn, but in my family, it was boiled in butter and salt. If you are somewhat adventurous, you add a bit of Zataran’s Crab Boil to the water. Gives a distinct taste and a little zinger of pepper. A week later, LA was drenched by a series of long-awaited rain storms. We talk about the long dry spell on the Photo of the Week page on Corndancer dot-com. Click on the link and get in on the drought and the relief proffered from on-high. 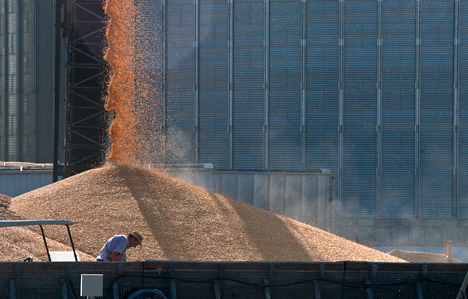 the corn harvest in our Weekly Grist Gallery. 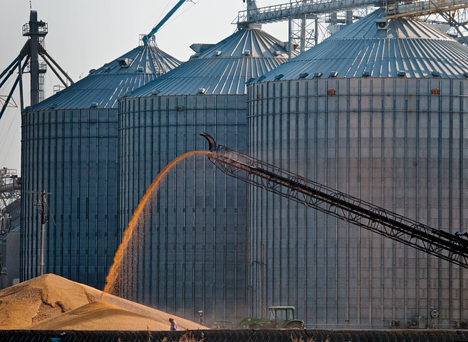 Take a look at the man in the bottom of the picture and you get an idea of the enormity of the gigantic grain bins. Orville Redenbachers dream scene. When cotton was king, the harvest came much later and for the most part, that was that. No more crops until next spring when it was time to plant cotton again. Now most farmers raise two crops a year from the same field. Corn and winter wheat are a good rotation. Some rotate soy beans and winter wheat. These fields were cultivated by men and mules in our lifetime. (At least some of our lifetimes). They are now cultivated by men in tractors as big as a small cabin, guided by a GPS. Sometimes, particularly after a prolonged period of parching, a puddle is a positive premonition that the environment is pushing to parity. A week later we finally were subjected to a downpour of sorts. I’d give it about a 5.5 on a scale of ten. Despite a mediocre rain, the grass and yard plants recovered in record time. Their resilience is amazing. 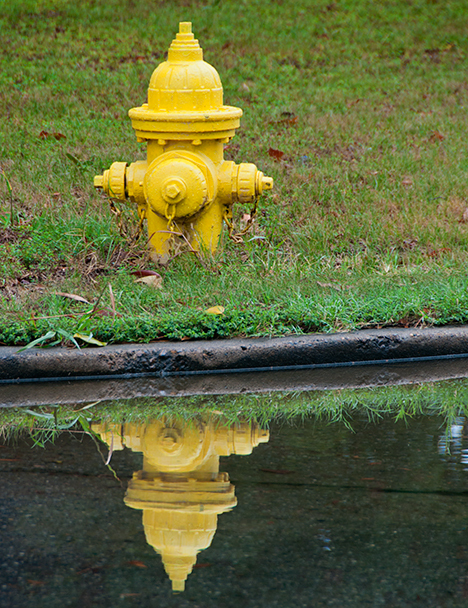 When the weather has been as dry as it has been here, a fire plug reflecting in a puddle becomes a welcome site. Perhaps even an art form. Life goes on. See larger pictures of what you’ve seen here plus more pictures from the same shooting sessions. Twelve in all: Hot and dry, wet and green. Weekly Grist for the Eyes and Mind. 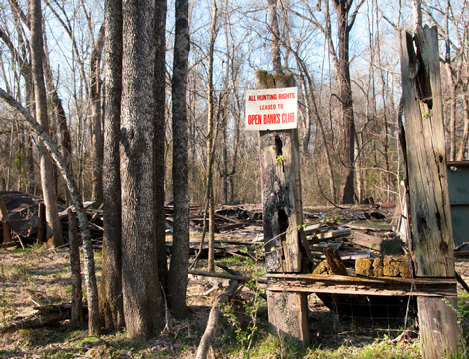 This old gin at Ladd, Arkansas was built in the late 1800s. The gin machinery was powered by steam. In the 1920s it was removed from service as a gin and has been used for storage since by a plethora of owners. Apparently it was built with the "right stuff." Most of us enjoy looking at old barns and houses which, despite the ravages of time have managed to remain standing. These structures are monuments to the societal and economic fabric which helped make us what we are, for better or worse. 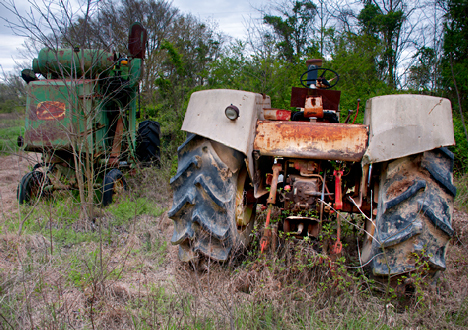 In agricultural communities, there are other remnants of days gone by, to wit: abandoned farm equipment, another part of the living museum one observes in the hinterlands. Before we go much further, may I suggest that you click here and see another view of this old gin and a lilac-covered combine where this epistle started on the Corndancer Photo of the Week page. We’ll wait here. This old tractor and combine, long since abandoned are part and parcel of a farm I found which appeared to have come to a definitive and abrupt stop. While old rejected tractors and combines don’t have the emotional appeal of old barns and cabins, they still have a story to tell. 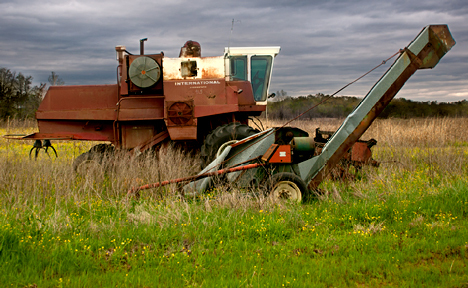 In March of 2009, I was cruising the roads of northern Lincoln County, Arkansas and happened upon a respectably sized farm through which was scattered a number of farm implements which appeared to have been abandoned in place. From the looks of things, someone said, “OK that’s it,” and everyone dismounted and left. Perhaps it was not quite that dramatic, but the appearance is there. This abandoned combine and grain auger, are parked in the field where they were probably last used. The opening in the combine behind the cab shows evidence of someone harvesting some parts from the harvester. Walking off from equipment of this type is no small thing. The combine you see above cost more than most people’s homes. Tractors are not far behind in the pecking order of cost. So while the equipment as it sits now is little more than junk, at one time, it represented a major league investment. We do not know the complete story here, but odds-on, it did not have a happy ending. The cultivated fields of the farm were interspersed with patches of pine woods. 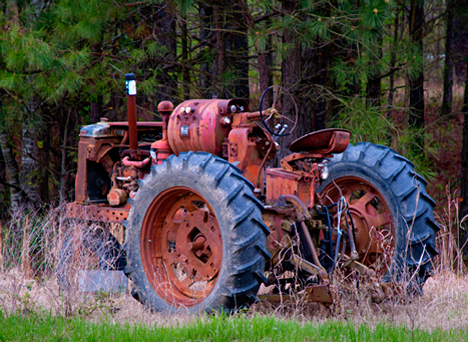 This old tractor sat near some of those trees. It is older than some of the other equipment I saw. Probably it was cannibalized for parts to keep a similar unit operational. Lest I give the impression that agriculture in this neck of the woods is all but sunk, hear me say that nothing could be further from the truth. While agriculture is feeling the same economic pinch all of us are experiencing, as an industry it is alive and well. At least in these parts. The face of the industry is different. Like all successful modern pursuits, agriculture takes advantage of cutting edge technology. Agriculture, however, has one advantage that never changes. To change products, you do not have to rebuild the factory, you plant different seeds. 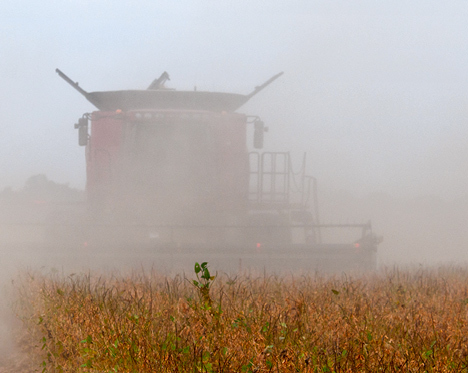 With the appearance of a horned apparition materializing from a a foreboding fog, this late model combine is harvesting soybeans off Townsend Road near Moscow, Arkansas. As big as a house and as high-tech as an aircraft, the combine above does its job with great efficiency. However, most combine owners still complain that it is a machine which begins to shake itself apart as soon as you crank it up. But it cuts bean bushes, separates the beans from stalks and hulls and spits the latter out the back while storing the former in its innards. All so you can have margarine, cooking oil, and the gazillion other things that come from soybeans. Each week we put all of our Corndancer and Weekly Grist pictures along with the ones we did not publish anywhere else in a special pictures only gallery. Click here to go there and see for yourself. The prognosis for this old barn is good. It is well used by my friend Eddie Snider and his cohorts in the Open Banks Hunting Club near Arkadelphia, Arkansas. The barn as you see it, is in its third permutation. It started out with only the breezeway and the enclosed section to the right sometime in the early 1900s, so we are told. The first addition was the near breezeway to the left, then the second to the left and finally the breezeway to the right. It’s a dead giveaway because you can see where the new roof joists were attached to the old ones. The originators were adding functionality before the word was invented. An old bike hangs in the old barn. See it at Corndancer dot Com. The story of this barn started on the photo of the week page at Corndancer dot Com. To see other pictures of the barn and see an old bicycle hanging in the barn, click here to go there, a cool thing to do. We’ll wait while you check it out. The barn was originally a horse and mule barn. You can tell by the height of the big doors which will accommodate a man on a horse without bumping his noggin or knocking his hat off. As you look at the front of the barn, there is a nondescript notch cut in the top of front opening. The back opening is as it should be. Seems one of the members had a motorhome to park in the breezeway. While said breezeway would handily admit a man on a horse, a motorhome was wont to fit. A chainsaw solved the problem resulting in the snaggle-tooth notch in the front door. Fifty years or so ago, the land on which this barn is located was under cultivation for row-crops. Changing agricultural trends being what they are, the land is now dedicated to timber and is selectively harvested from time to time. In the meantime, critters, not giving a tinkerer’s damn about business trends do have a deep and abiding appreciation for favorable habitat. That being so, the timber habitat has the appeal of a pleasure palace and smorgasbord to God’s creatures, so the woods are full of ’em, including a couple of alligators in one of the ponds. Life is good when it is harmonious. Not quite Stonehenge on the Ouachita, a couple of old cross-ties used for structural members in the barn that fell stand as a memorial to the crumbled structure. There were (were being the operative word) two barns on the property until an untoward wind several years ago put one of them on the ground. Some remnants survive in stacks to remind one of where it was. Only the strongest survive, even in barns. 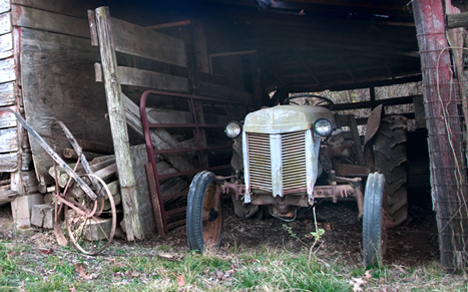 The old tractor holed up in this precariously leaning barn looks like a Model 9n Ford-Ferguson tractor, which unbeknown to most, was a turning point in the tractor business. The Ford-Ferguson was the first tractor to offer a three-point hitch, invented by Harry Ferguson, and recognized by Henry Ford as something he had to have for his line of tractors. Ferguson Ford tractor in an old barn not far from the barn with the bike. Before the three point hitch was invented, connecting implements to a tractor was a pain in the keaster at best, requiring a lift device or several full grown men helped by a half-troop of Boy Scouts, grunting and groaning to get stuff hitched. With the three point hitch, the tractor operator backed up to the implement, attached it and went about his business. Easy hookup, less hernias. Such a deal. Meanwhile, back home in LA (Lower Arkansas), spring has served notice that like it or not, it is here. My windshield as covered with the first gossamer film of pollen day before yesterday. This will be replaced in a couple of weeks by an onslaught of yellow powder that would have worked well as one of Pharaoh’s plagues. 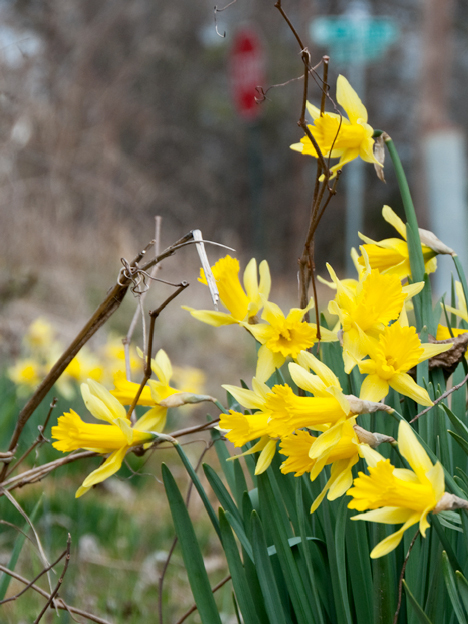 Today, blooming jonquils confirmed the seasonal shift. These jonquils are "volunteer." They appear annually in the same place. They are not attended to, fertilized, molly-coddled or otherwise taken care of. They, being urban posies have the toughness of the hood, if that's possible in a flower. Since they survive nicely, one can only suppose that they do. Thanks to my friend Eddie Snider for ferrying me about the boondocks on his four wheeler. We are 6-2 and 6-3 respectively. Neither of us is in marathon condition so the little Kawasaki was toting a fearsome load. It did well as we are here to bear witness. See a collection of better quality pictures from this trip, including some not posted otherwise, in a high-resolution gallery. Click here to go there. 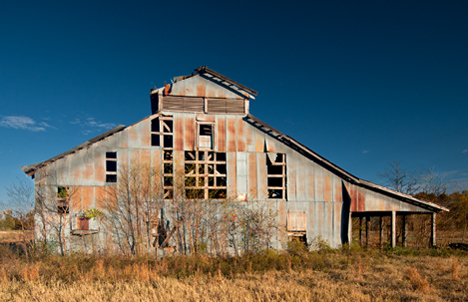 This old barn is at the corner of Arkansas Highway 366 and Elm Road near Roe, Arkansas. Those who know about this old barn agree that it is at least 133 years old and probably a bit older than that. 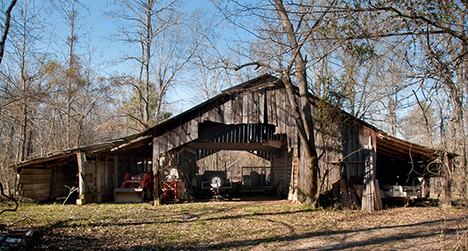 The barn is on Arkansas Highway 366 near Roe, Arkansas. The story of this barn started on the Photo of the Week Page at Corndancer Dot Com. To see how it started, with two additional pictures (count ’em, 2), click here to proceed to the photo of the week page, a very cool thing to do. The barn fell from use when the farm upon which it stands changed hands in 2004. That it remained in use for more than 128 years is probably why it is in the good, but deteriorating condition we find today. Certainly, at that age, the barn was originally built to provide stall space for the farm mule herd. “Adaptive re-use” by subsequent owners required interior modifications, some of which you see below. These storage rooms in the barn are a post-mule era addition. The area above the rooms provides a home for a nice sized barn owl. Finding the barn was on a whim, which was on a route determined by a previous whim. Sometimes I believe our whims are weighted to our experiences, and I believe this was the case on discovering the old barn. Earlier, a bit to the south in Arkansas County, north of Stuttgart AR, I turned on to Arkansas Highway on the aforementioned “previous whim.” As a result, I ran across the crop duster airstrip below. The curved top structure you see is at the north end of the runway and not far above waist high to me, at 6'-3." You just don't see this sort of thing often. Ever? There may be a far-fetched explanation. The little building looks a bit governmental, perhaps even somewhat 40’s era military, which gives rise to the explanation. At nearby Stuttgart, Arkansas, there was a US Army Air Corps training facility. I’m betting that in an earlier permutation, this was an ancillary strip to that base. The building, under those circumstances would have held a few spare parts, fuel and oil. Maybe some contraband elixirs as well. In the absence of other explanations, that one will have to do. December 17, 2010 – It was recently revealed to me that there were a number of these small strips with these mystery structures scattered around Arkansas County. They were a part of the Air Corps training base. The small buildings held radio direction finder transmitters to which the fledgling pilots navigated. When the installations were in use there was also an antenna about the size of a baseball backstop that was a part of the facility. My friend Don Martin provided this historical tidbit. By then, my stomach was telling me it was time to take on nourishment. With any kind of luck, a country store with a talented sandwich maker would soon materialize and sho-nuff, in short-order, I wheeled into Cascoe, Arkansas, home of Cloud’s Grocery. Clouds Grocery at Cascoe, Arkansas is a fine stop for sandwiches. I did not bother to read the sign informing the general public that Clouds Grocery was a indeed a purveyor of sandwiches. That’s probably why I garnered the quizzical look from the proprietor when I made the sandwich inquiry. Like most country stores, asking for wheat bread is an exercise in futility. That aside, the two-fisted ham and turkey sandwich I got was running over with the meats, plus lettuce, onions, pickles and tomatoes. It was a masterpiece. I wolfed it down and now I was well fortified for the next whim, which resulted in discovering the barn. After the barn, on another whim, I sallied forth up US Highway 79 to Clarendon, Arkansas. The good folks at Clarendon saw fit to keep the old Merchants and Planters Bank building in good condition. It is now their visitor center. Since it was Sunday afternoon late, the doors were locked. A return trip during business hours is a must. Clarendon was like a lot of other small communities with a strongly weighted agricultural economy. They had a “Merchants and Planters Bank.” There must have been a jillion M&Ps in the south, many of which of which are now decaying wrecks. Not so in Clarendon. The nicely preserved and still-in-use Merchants and Planters Bank building in Clarendon AR. Good job folks! Less than six weeks ago, we were griping about too much rain. Those of you who read these epistles on a regular basis will probably remember my laments regarding overkill in our seemingly endless spring rains. Take a look above. The problem has done a 180. The tractor operator is preparing a seed bed for imminent planting. Soybeans are probably what will be planted. The earlier rains prevented many farmers from planting their beans. Now there is a sense of urgency. Not so at the barn.